Happy New Year from our Tuscan Gardens® family to yours. We would like to begin 2018 by thanking our wonderful residents, associates, and suppliers for making 2017 an unforgettable year. 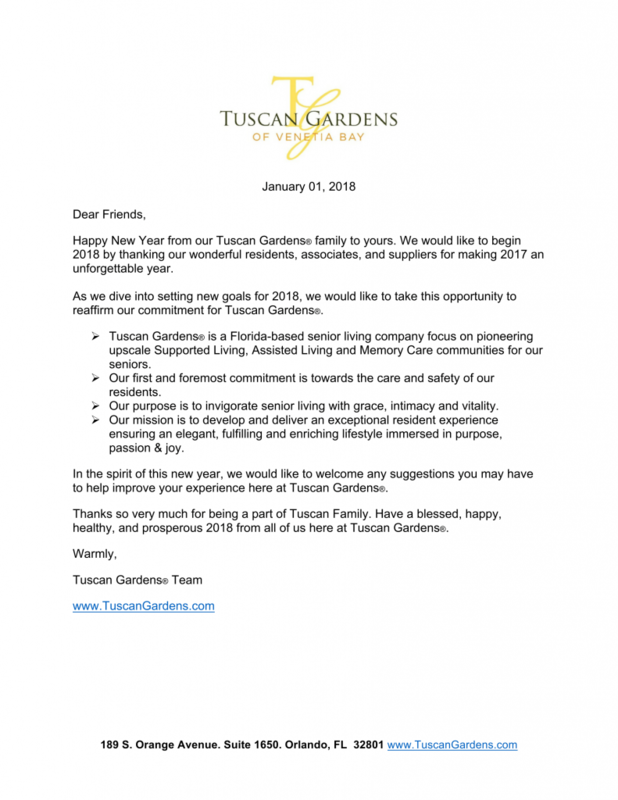 As we dive into setting new goals for 2018, we would like to take this opportunity to reaffirm our commitment for Tuscan Gardens®. Tuscan Gardens® is a Florida-based senior living company focus on pioneering upscale Supported Living, Assisted Living and Memory Care communities for our seniors. Our first and foremost commitment is towards the care and safety of our residents. Our purpose is to invigorate senior living with grace, intimacy, and vitality. Our mission is to develop and deliver an exceptional resident experience ensuring an elegant, fulfilling and enriching lifestyle immersed in purpose, passion & joy. In the spirit of this new year, we would like to welcome any suggestions you may have to help improve your experience here at Tuscan Gardens®. Thanks so very much for being a part of Tuscan Family. Have a blessed, happy, healthy, and prosperous 2018 from all of us here at Tuscan Gardens®.